I was a Daddy’s girl. I loved my dad. I loved that I looked like him. He was a great man. A generous man. A godly man, honorable and well-respected. Qualities to be emulated. I learned a lot from him…just by watching him. Are you a parent? When you look at your child, do you see yourself, your spouse, or some other family member? Does your child “have” your eyes, your fingers, your build, your hair, your nose, your mouth? Who does your child act like? Does he or she “have” your mannerisms, talents, same interests, and so on as you or your spouse? Then that child is like its parent, in the same manner, the same character. Just a smaller version. 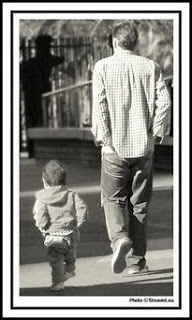 Do you have a little boy who wants to imitate and pattern everything after his father – walk like him, talk like him, act like him? Does he follow Daddy around like a little shadow? The same is true of little girls wanting to mimic their mothers. Little kids love to imitate. That’s how they learn. When God looks at you, what does He see? He sees you as His child, made in His own image. If He made us all in His likeness, then we must put on His behavior and act like Him. We are His Name’s sake, His family. Just like our Brother Jesus copied His Father, we are to be like our Heavenly Father. Do what He does. Walk like He walks. Say what He says. Be what He is. The Father desires His children to learn of Him, to listen to Him, to obey Him, and just to be with Him. But until we sit at the feet of the Source of Peace, we will not resemble the Father of Peace or our Brother, the Prince of Peace. This is true with all the other qualities of God. I want to be like my heavenly Daddy. In order to do that, I need to keep my eyes on Him, watching His every move. Knowin’ what you’re goin’ through and feelin’ it the same. ~Yes, Lord, may I have Your eyes to see the needs of others, their pain, unrest, and confusion, and may I be Your hands of comfort and strength to lift them up, Your lips to give Your words of encouragement, Your ears to listen to them, Your shoulder on which they may lean, Your feet to walk with them, and Your heart of compassion to offer what they need. Amen!